Along California’s coastal Highway 1, south of Half Moon Bay and north of Santa Cruz, sits Davenport CA. Many travelers no doubt speed by this quaint town on their way to or from more popular destinations. But if you happen to be traveling along this stretch of road, slow down and enjoy Davenport CA, and all that it has to offer. After all, this area is known by locals as the slowcoast. Within walking distance is Davenport Beach, a beautiful place that’s a favorite of visiting photographers. In the spring, wildflowers bloom upon the green hills, and many rocky formations, including the famous Davenport Crack, serve to create breathtaking landscape scenes. Unique rock formations, including the “Shark Fin,” can also be found at Davenport Cove Beach, as well as a waterway that runs through a cave tunnel forming a small mossy waterfall. 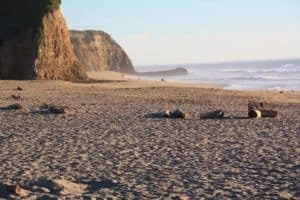 Steep cliffs, rock shelves, and large expanses of sand can be found at Bonny Doon Beach, which lies at the mouth of Liddell Creek, southward on Highway 1. 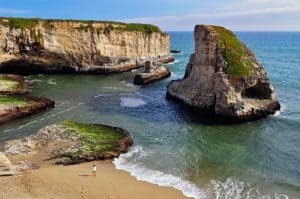 Davenport is definitely worth a visit, so read our Davenport CA Travel Guide and start planning your vacation here today. For an extensive list of all the great Central California beaches, visit here. The best time to visit Davenport is from September through November when the summer tourists have returned home, leaving a bit more room on the beaches, walking paths and other attractions. December, January and February see a slight dip in temperatures, which nonetheless are warm enough for the monarch butterflies who overwinter at Natural Bridges State Beach. The months between April and May are characterized by mounting temperatures and special events that meet their nexus in June, July and August. 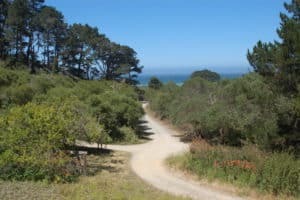 A refuge for wintering Monarch Butterflies, this park boasts a sandy cove, tide pools, a nature trail through the Butterfly Preserve, and several hiking trails. There is also a bicycle path around the perimeter of the park. A massive rock stands guard over a small cove full of geologic wonders just up the coast from Santa Cruz, only 0.7 miles south of the town of Davenport. 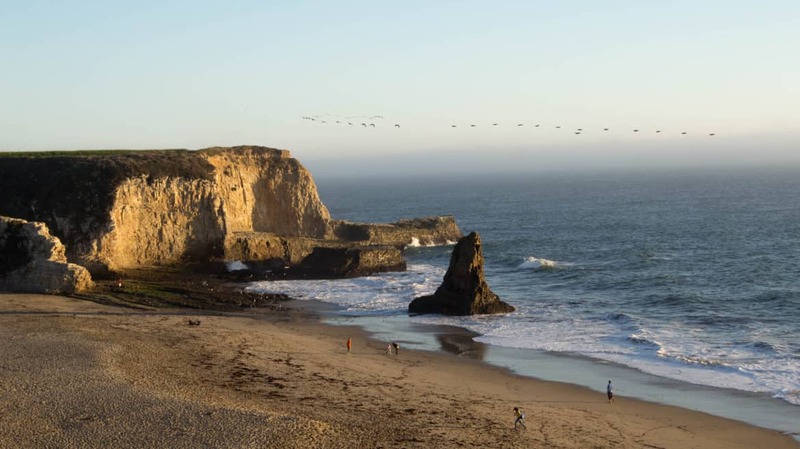 The main geologic feature, visible from Highway 1, has inspired two interchangeable names: Shark Fin Cove and Shark Tooth Beach. This beach is most certainly a cove, however, and it’s fun to imagine the size of shark lurking beneath a fin of that size, so we’re using the former here. Davenport Pier Beach is the northern of two beaches right in the tiny town of Davenport, CA. This beach is across from the huge concrete and cement plant that’s visible at the north end of town. Davenport Pier, a frequently photographed landmark, is at the beach below the bluff, but it is not easy to get to. Eager photographers make their way down to capture sunset pictures of the pier foundation arches which stretch out into the surf. Scott Creek Beach is one of the nicest beaches in the Davenport area north of Santa Cruz. The beach is right next to Highway 1 as it dips into the Scott Creek Valley north of Davenport Landing. Scott Creek runs into the ocean at the north end of the beach and Molino Creek crosses the beach at the south end. The shallow channel formed in the sand when Scott Creek is flowing can be fun for kids to play in. Most people settle into the beach between the creeks but this beautiful coastline invites exploration north and south. 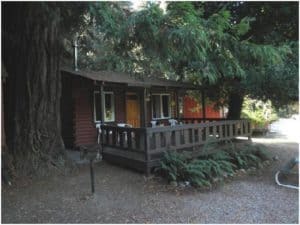 Truly relax and enjoy the Slow Coast cabin located on 22 acres of remote redwood wilderness privately tucked away but just minutes to beaches, trails and farms. The cabin is made from reclaimed timber and features an open floor plan with indoor wood stove, a large sleeping loft and wrap around deck. Enjoy sitting on the deck next to the beehive fireplace in the evenings, soak in the claw-foot tub or take a rain shower. The kitchen has an O’Keefe & Merritt Stove and full kitchen. For more information, pricing or to reserve your stay visit Slowcoast Lodge. The Hilton House- Redwoods Tranquility is located in Forest Park. 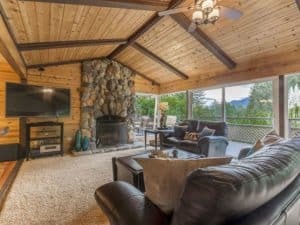 Featuring mountain views, this vacation home also has free WiFi. The vacation home has a TV with satellite channels, a well-equipped kitchen with a dishwasher and an oven, and a bathroom with a bath. For more information, pricing or to reserve your stay visit The Hilton House – Redwoods Tranquility. Featuring access to the private River Beach, this Felton resort is 8 miles away from Santa Cruz Beach Boardwalk. A campfire and game areas are featured. A terrace with barbecue facilities is featured in all cottages. 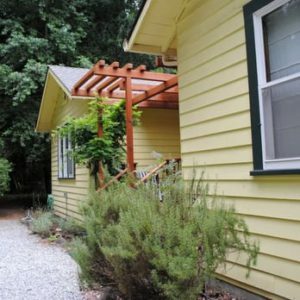 Featuring a river view, each cottage provides free WiFi, a seating area, cable TV and an private bathroom. Natural wood accents are featured in all rooms at Fern River Resort. Select cabins offer a fully equipped kitchen or a fireplace. For more information, pricing or to reserve your cottage visit the Fern River Resort. Each room is decorated with antiques and collectibles, and carefully prepared with crisp linens, fluffy comforters and towels. Four rooms have original redwood paneling on high ceilings and walls. 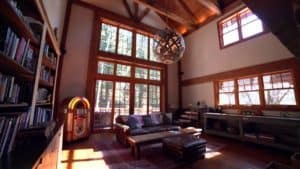 A spacious common area features a river rock fireplace and firewood, original redwood panel walls, and woodland views. The setting is perfect for a complimentary glass of wine or tea, served each afternoon, year-round. For more information, pricing or to reserve your room visit Fairview Manor Bed & Breakfast. Make your California trip special by choosing our well-appointed rooms and suites. 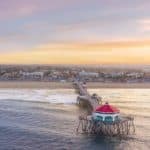 They offer a premium location within walking distance of the famous beach boardwalk, Downtown Santa Cruz and top local restaurants. Start your day with a free continental breakfast. 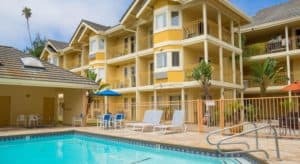 Relax at their heated pool and hot tub, and stay connected with free Wi-Fi. They also offer pet-friendly accommodations and 24-hour front desk service. For more information, pricing, or to reserve your room visit Hotel Solares. I have heard about Davenport but never been there. My sister went there and she told me how amazing this place is. She stayed in one of the hotels you have mentioned i.e., Hotel Solaris I by hearing feedback from her I must say what you have mentions is so true.Thank you so much for sharing your Honest review for heavens on this Planet Earth. You are welcome Sarah and glad you enjoyed! Your turn for a vacation to Davenport California! Thanks for this information about the Davenport CA area. Its good to have good place to relax and appreciate nature, play games, meet new people and forget your trouble. Its another opportunity to enjoy wildlife and Santa Cruz whale watching. What about the price of visiting this place. Hope not too expensive? Davenport looks like an historic sea sight that promises great and memorable time. Thanks for this info will like to visit this place in the future. I think you would have a great time in Davenport. 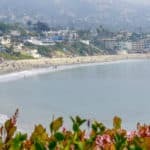 It is really hard to give you a price, but the area is inexpensive when you compare it with the more southern beach communities in California. If you can give me the particulars for your trip, I can give you a pretty good idea of what it might cost you. I am currently doing more extensive research on davenport, it is one place I will love to visit in the near future. I am also planning to introduce the idea to my boss, perhaps he may want to go there on vacation. The weather conditions and serene environment will surely be a point of attraction to visitors. Yes, Davenport is a great beach travel destination and does have a lot of great conditions conducive to a really great vacation 🙂 If you need any further information, please don’t hesitate to ask. Daveport is breathtaking and I am looking forward to some relaxation here for sure. I am thinking I like the Hilton House Hotel . To me I get the best of both worlds, I have the beautiful beach and then I have the great mountain scenery. I don’t think it can get better! 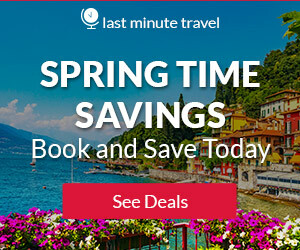 How long should I plan for a say if I want to visit the beaches and someof the attractions you have listed? If you can take 2 weeks off for your trip to Davenport, you will get to experience the whole area and the beautiful beaches. I think that 2 weeks is really how long you need to really enjoy, relax and have fun! Thanks for visit5ing my Davenport CA Travel Guide. Thank you so much for providing this detailed information on Davenport. I feel this post is a one-page lonely planet, so informative and helpful. I am really interested in Shark Fin Cove and really like the Youtube video clip. The view is tranquil and stunning. I should be planning a short trip soon during the best time that you recommend. Once again, thank you for sharing this. You are welcome Ben and enjoy your visit to Davenport CA! 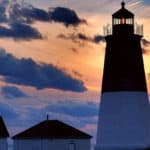 Thanks for such an amazing post, davenport is a very beautiful location to behold as a tourist, although i live in Africa I have visited the United States numerous times but never have I visited Davenport, I guess this is the moment I’ve been waiting for thanks for revealing such a beauty. Time to plan my trip to California! I am glad you enjoyed my Davenport CA Travel Guide Seun. Thanks for visiting! This video from youtube is incredible. Dron footages are amazing. Let’s be honest, California is one of the most popular states for tourists. But it does make sense! Anyway, this Hilton hotel looks cozy and comfortable. However, B&B option looks to have more climate. Which one you will recommend to stay with wife and kids? I would pick the B&B hands down, it is a great choice, especially with the family. I agree that California is just one of the the US states that has so much. If you are a beach person, like me, then more so 🙂 Thanks for visiting my Davenport CA Travel Guide. Leahrae, The way you describe Davenport is terrific. I have never been to that area of California, yet you make it so interesting especially the various areas specifically to photograph. Seems like the perfect place for sightseeing or just a weekend getaway. Great detail in your post. Being in cold Ohio it makes me yearn for a beach right now! When I have time, I want to read some of your other posts about different destinations as well. Beaches are my go to vacation spots, especially if they are close enough to drive to other areas to explore. Hi Bill, oh yes you do live close enough to drive to a lot of the beach destinations I have reviewed! And I can certainly understand wanting to get out of the cold. I lived in it for far too long, and now live in beautiful Florida on the beach. 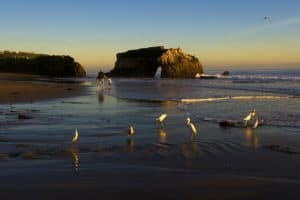 I agree, that beaches are also my go to vacation, probably my only vacation type LOL Thanks for the visit to my Davenport CA Travel Guide. Sounds like we are in the same boat 🙂 I live in Florida as well. California would have been my first pick, except the housing there is so expensive compared to hear in Florida. And we do have amazing beaches! Thanks for visiting my Davenport CA Travel Guide. Years ago my wife and I lived and worked in San Francisco. We drove to Santa Cruz and then south on Hwy 1 on one of our excursions. Having read your post on Davenport I wish we had gone north instead. Lots of things to do and as I am a scuba diver, or at least was at the time, it would have been really good to get out for a dive there. Your post makes me want to go back. Maybe that will happen sooner rather than later. Thanks. I hope you do get back to the area Ed! Either way you drive though, it is all beautiful. Now you can drive north and experience another beautiful area of California. Thanks for visiting my Davenport CA Travel Guide. You could most definitely spot a dolphin or two, especially if you went out on a boat. That would increase your chances quite a bit. I love to kayak, and I think you would find it to be a great experience, especially someone beautiful 🙂 Thanks for the visit to my Davenport CA Travel Guide. Davenport looks fantastic! I’m wondering about the beaches, though. 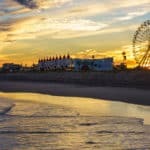 This article makes it sound like all the beaches are public and free for exploring, but it seems like every time I’ve been to California that’s not the case. 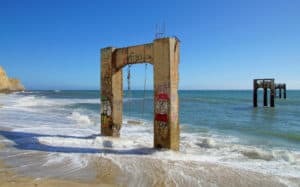 You meet a lot of “No Trespassing” signs along the beach. Is it really free to explore the way you make it sound, or will I get surprised by private beaches and exorbitant parking fees? No, in Davenport, it really is free 🙂 No surprise, but I do know what you mean. I think it is there way of using the fees to take care of their wonderful beaches. We have that here in Florida as well, I don’t know of any beach that has free parking. But the beaches are all taken care of and beautiful. Thanks for the visit! I love what you wrote about Davenport Beach. I’m actually from CA, now living in CO, but I used to go to Davenport Cove beach to go bodyboarding with my friends, and after we would always go eat lunch and drink craft brews at the Cremer House, I really love that place and that whole area, I wish I could buy a house on the beach but the wife doesn’t want it. Wow, would I would give to live there. I lived in Colorado which is beautiful, but am now in Florida…next best thing to California in my book. Davenport Cove beach is wonderful! Thanks for visiting my Davenport CA review! Thank you very much for coming up with this great post, Davenport is such a great location and the views are really amazing, the images here shows truly well that it is such a condusive location for tourism and vacation. I will share this post with my friends maybe we can Consider going there to celebrate our high school reunion. Oh boy, what an amazing place this would be for a high school reunion! Davenport is absolutely breathtaking. I think you could easily convine everyone 🙂 Thanks for your digital visit to Davenport CA. One thing I am captivated about is the boat diving but then if one if willing to travel only by December what do you suggest I carry along as a tourist to this beautiful Davenport. Your review on this place is cool and wonderful, you have done a great job compiling all these information together. I really appreciate all the nice pictures too. Thank you Salim, I am glad you enjoyed my Davenport CA Travel Guide. As far was what to take along, think of a warm summer day and take appropriate clothes for summer, as well as a light jacket, some good walking shoes, and some lightweight pants. Please let me know if you have any other questions. I am a lover of good things in life and I should say that beach would be Avery nice place to unwind the the while watching the sun go down along the horizon and while doing so acold beer is on my hand that will be the I don’t know bhow to kyak and that bigest issue I can’t swinm either so that is how ended up on the beach with a cold beer unwinding. Well, weather you are in the water or now…beaches are always great 🙂 You can sit on the sand, enjoy a cold drink, people watch, get involved in beach games, and of course watch the beautiful sunrise or sunset. My mom was deathly afraid of the water, but she still loved to go to the beach. Thanks for your visit to my Davenport CA Travel Guide.